You are currently browsing articles tagged parasites. Planning a safe and effective parasite control program for your horse should include a consultation with a veterinarian. This article is not a substitute for a consultation with a veterinarian. 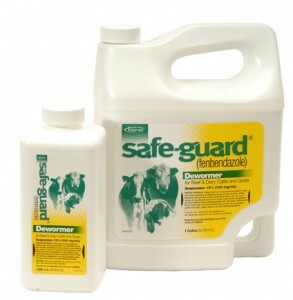 Safe-Guard dewormer for cattle and goats, which contains 10% fenbendazole in a liquid suspension, can also be used to deworm horses, ponies, mules, and donkeys – both at the single dose rate and at the fenbendazole purge dosage. The fenbendazole or Panacur purge is a double or purge dose of fenbendazole, the active ingredient in Panacur horse dewormer, administered once per day for five days in a row. The fenbendazole purge deworming regimen for horses specifically targets encysted small strongyles. Small strongyles pose a serious health risk to your horse, and are not affected by most dewormers while in the encysted state. 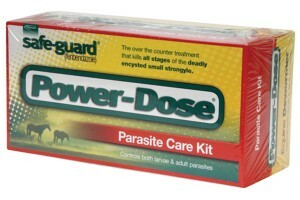 The fenbendazole purge, also called the Panacur purge, Panacur PowerPac, and Safe-Guard Power-Dose, is a multi-day deworming treatment that targets specific life stages of the small strongyle, an internal parasite that infects horses. Fenbendazole is a member of the benzimidazole class of deworming drugs, and is the generic name of the active ingredient in Panacur and SafeGuard dewormers.